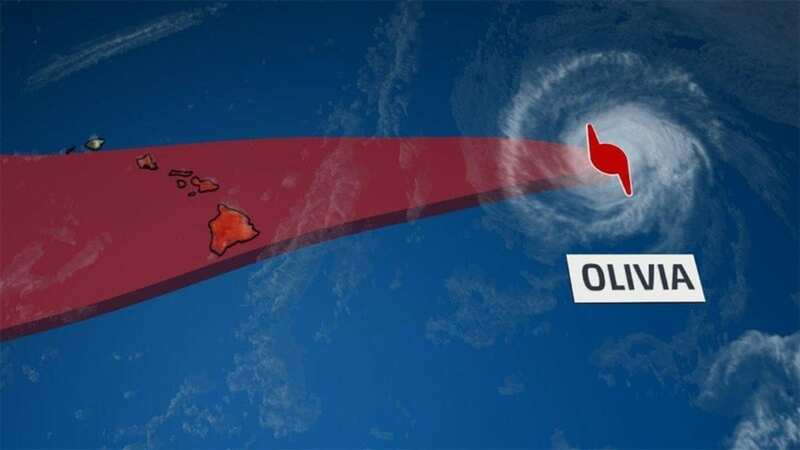 On Hawaii Tourists in Waikiki and elsewhere on Oahu, along with tourists on the Island of Hawaii Maui, Molokai and Lanai should be aware and get ready for tropical storm Olivia. A warning now includes all Hawaiian Islands except Kauai. Kauai is under a tropical storm watch. The storm will sweep through Hawaii Tuesday night and Wednesday, potentially bringing flooding rainfall, strong winds and pounding surf. Tourists flying in and out of an airport on Wednesday or Thursday this week on the Islands of Hawaii, Maui, Molokai, Lanai, and Oahu should check with their airlines before heading to the airport. Hawaii Gov. David Ige issued an emergency proclamation for the counties of Hawaii, Maui, Kalawao, Kaua‘i and the city and county of Honolulu on Sunday to free up resources and money to expedite preparation and mitigation efforts ahead of Olivia. Honolulu County and the Island of Oahu was just added to the Tropical Storm Warning. A Tropical Storm Warning means tropical storm-force winds are expected somewhere within this area within the next 36 hours. Honolulu Mayor Kirk Caldwell told the Honolulu Star-Advertiser that residents should prepare for the storm but not hoard emergency supplies. A tropical storm warning has been issued for Oahu, Hawaii and Maui counties, including Honolulu and Hilo. This means winds of 39 mph or greater are expected within 36 hours. Kauai and Niihau are now under a tropical storm watch, meaning winds of 39 mph or greater are possible within 48 hours.